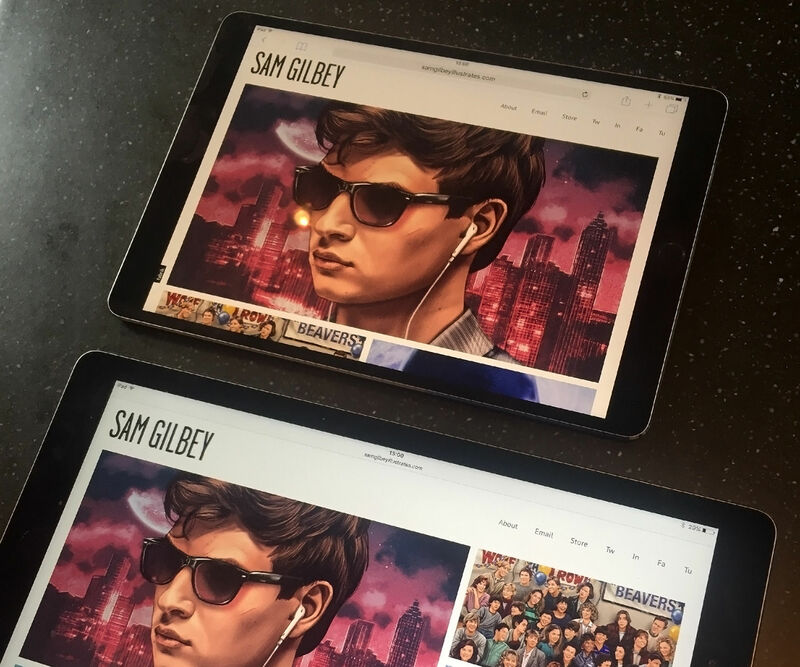 We’ve worked with artist Sam Gilbey to give you the definitive review of the new 10.5-inch and 12.9-inch iPad Pro models whether you want to use it for illustration, digital and graphic design, video or animation. Apple’s new iPad Pro tablets are available in two sizes – one with a 10.5-inch screen (above) and one with a 12.9-inch display. There are two main groups of creatives who would consider buying the iPad Pro: artists and, well, everyone else. 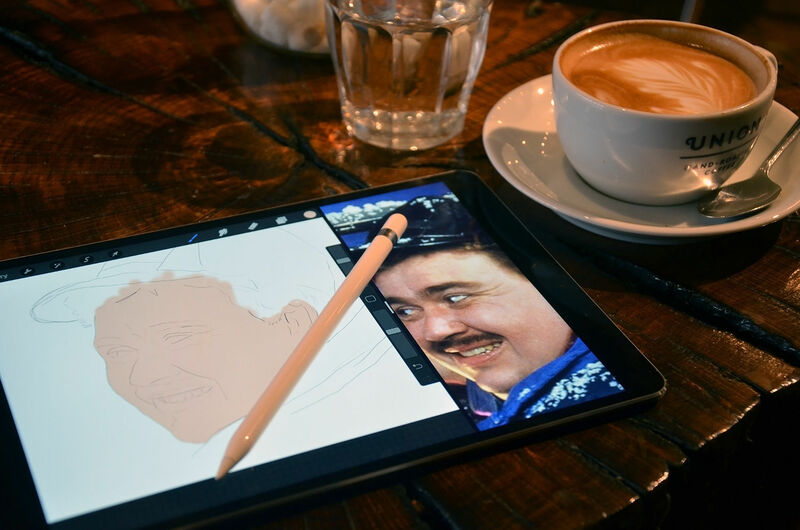 Artists can get the most out of the iPad Pro, as it’s possible to create a fully finished artwork on the iPad Pro – or at least get nearly there before transferring to a desktop for the final touches. For designers, creative directors, animators, 3D artists and the like, the iPad Pro is for when you start and after you’ve finished. It’s a digital sketchbook combined with a way to show off prototypes or finished products/products. Though this may change with this autumn’s operating system update, iOS 11. 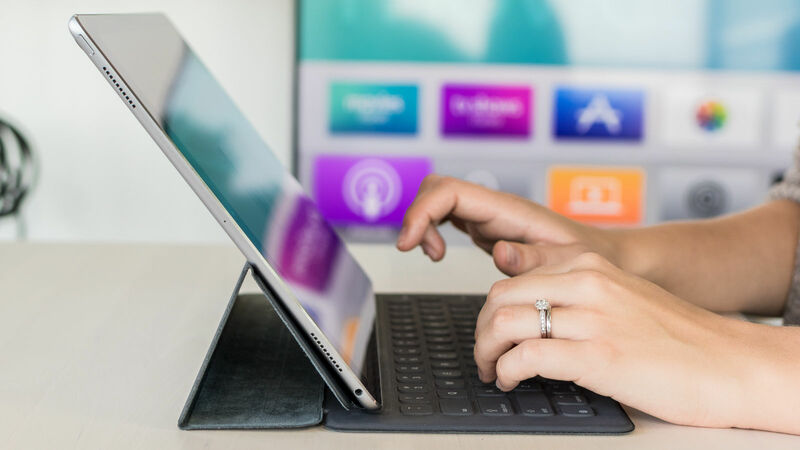 For all creatives, Apple’s tablet lets you do the more administrative part of your job – email, Slack, invoicing and the likes – in a shell that’s lighter and more portable than a laptop. And the same’s true for where it sits in your home life too – it’s just more comfortable to watch Netflix in bed, or share a game, or show off what you’ve drawn on a tablet. Both sizes have new features including a faster processor, faster refresh rates for smoother drawing (which automatically slow down to save battery when not needed), and automatic colour temperature adjustment to match the lighting of where you are. With its predecessor launched in 2015, the new 12.9 model (above) gains the new screen tech that debuted in 2016’s 9.7-inch iPad Pro – brighter, less reflective and with a wider colour gamut. The resolution remains the same at 2,732 x 2,048. The 10.5-inch model has a noticeably larger screen than its 9.7-inch predecessor – but whose shell is only slight larger due a thinner bezel between screen and side. It has a screen resolution of 2,224×1,668 – 18% more pixels than the 9.7-inch – but it’s the 20% larger surface that’s more important. The smaller iPad Pro is also available in one more colour than its big sister – the pink-but-thankfully-not-Barbie-pink Rose Gold on top of Silver (standard), Gold (no, just no) and Space Gray (my personal favourite). Both are available in three capacities: 64GB, 256GB and 512GB. My experience with having the older 12.9-inch, 128GB model tells me that 64GB would be too small unless you’re really organised, so 256GB should be your minimum. To see how the new 10.5-inch version works for artists, I sent a review unit to digital painter Sam Gilbey – who has reviewed Wacom’s 27-inch Cintiq and MobileStudio Pro for us – and recently wrote a hands-on review of Microsoft’s new Surface Studio. I’ve been using the first-generation 12.9-inch iPad Pro for over a year now. I had tried drawing on previous iPads before the Apple Pencil was introduced, but it always felt like a bit of a novelty – and as such I tired of it quickly. Not having any pressure-sensitivity meant that rather than being able to change the width and weight of brushstrokes on the fly, you constantly needed to adjust the brush size and opacity to compensate. It’s not like these limitations held back David Hockney and many other brilliant artists who made great things with it – but for me, unless I really wanted to draw something while I was out and about, I always gravitated back to my studio setup of an iMac and a Wacom Intuos tablet. The 12.9” iPad Pro, and perhaps more importantly, the brilliant Apple Pencil was a game-changer though. I love working from home, but it’s also nice to be able to work on the sofa or in a café from time to time. So, whilst my work tends to get completed on my iMac, a lot more of it is getting done on my iPad nowadays. The main painting application I use is Procreate, which I’ve found to be the most intuitive and fully featured mobile app. That said, Adobe Photoshop Sketch now supports Photoshop brushes and I’m starting to use that more – because I almost-exclusively use Kyle Webster’s brushes, which are just so good. Of course, once you’ve bought a new Apple device – whenever you’ve made the commitment– you can’t help but wonder when a faster/better version will come along. So while I was excited to try the 10.5” model, I won’t pretend that part of me wasn’t worried. If it was too good, too big a leap in performance, then I might need to upgrade rather than having to head shamefully back to my ‘ancient’, decrepit model. Talking of performance, let’s first take a look at those specs. The resolution is 2,224 x 1,668 at 264ppi with a 4:3 aspect ratio, a seriously impressive 120MHz refresh rate and a claim of 600 nits brightness. In terms of storage, your options are 64GB, 256GB or 512GB. Compared to the previous 9.7” model, it’s actually just 1cm wider (250.6mm compared to 240mm), because the bezel is slimmer. The new processor is an A10X Fusion, which Apple claims is 30% faster than the previous 9.7” iPad Pro, with 40% improvement on graphics performance. It’s mind-boggling to think of the power of these devices and the speed bumps that keep coming our way, but then of course it’s really about how it feels to use. 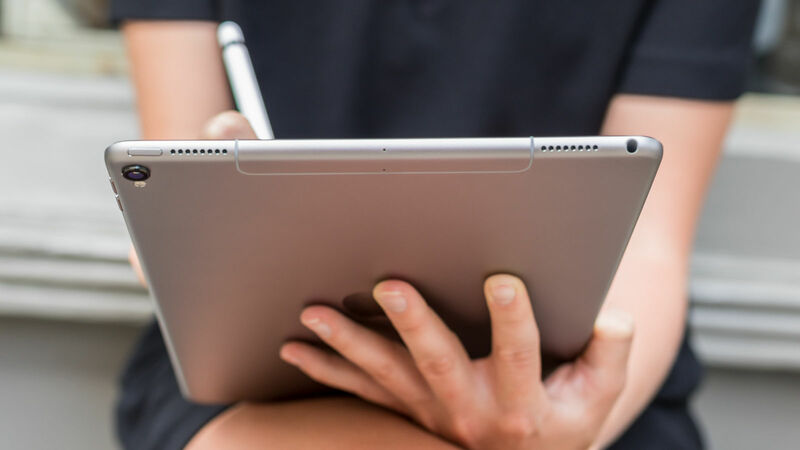 A 12.9-inch iPad Pro perfect for drawing – it’s like having an A4 sketchpad with you – but it’s not the most discreet device to have with you in public. Holding the 10.5” for the first time, that relative shrinkage really strikes you. Yes it’s more powerful than my first generation iPad Pro, but it feels positively cute by comparison. It’s more than half the size of course, but is more akin to having an A5 sketchpad with you. The iPad Pro was already fantastic in terms of the lack of parallax – how close the Pencil feels to the marks being made on screen – and an essentially imperceptible lag. It’s now down to a minuscule 20 ms latency, and honestly you’re barely aware of it. Though I should say, I’m not really aware of it on my older model either. The refresh rate has been doubled to 120 frames per second (which Apple calls ProMotion), and it really looks stunning. When you’re hopping from app to app, or scrolling a web page, it’s just so responsive and ‘alive’. Again, it was good before, but it’s just so smooth and satisfying with the new version. Then there’s the True Tone display, which adjusts the display for the colour temperature of the room, so that colours are more consistent in different lighting conditions. Side by side with my original 12.9” model in my studio, I noticed it had a slightly more yellow tint for instance. That’s not a feature I’m particularly interested in per se, but while my iPad Pro’s screen was already great, this is definitely even sharper and has more colour range and depth – to the point where you’re hardly aware it’s a screen at all. Everything is just ‘there’, and it being less reflective than previous models also helps in this regard. When you’ve got other business to attend to, that 10.5-inch display allows for what Apple call a ‘fully-sized’ keyboard on screen. Realistically it’s still a little cosy, and if you type a lot perhaps the large model would be preferable. Still, this extra room for typing, without compromising the ultra-portability of the device is certainly welcome, and I also found it very comfortable and satisfying to use the Smart Keyboard. With the stunning power of this device you really can have a mobile studio with you. It comes down in part to whether you’re able to use equivalent applications to those you’d normally go for on desktop. As an artist, with the excellent and intuitive ProCreate, and Adobe Sketch’s recent support for importing Photoshop brushes, this is becoming an easier decision to make all the time. It might not have replaced my iMac, but I find myself spending more and more time drawing on the iPad, which has really freed up my working day. By definition it’s a more intimate and comfortable way to work. Battery life is also excellent. Apple claim 10 hours, and of course it depends what you’re working on, how bright the screen is and so on, but you can certainly have this with you for a full working day. If you’ve never owned an iPad Pro, it’s certainly an excellent time to get one. It’s just whether you want to go for this fully-powered but more compact model – or the 12.9” is the right one for you. They’re both relatively portable and light of course, but it’s whether you want that A4 sketchpad with you all the time, or you prefer a more discreet notebook. While I don’t feel I made a mistake getting the 12.9”, I spent plenty of time drawing on this smaller model – though I found myself zooming in and out of my work a bit more, I was instantly able to get into the flow of working. Also I frequently use the iPad’s Split Screen mode, with a reference image taking up about a fifth of the screen. So that’s probably the main reason the larger model works best for me. Of course it’s also worth noting that iOS11 is coming very soon, and is set to include a number of updates with regards to productivity, such as a proper file structure and the brand new Dock, which lets you jump between apps much faster. 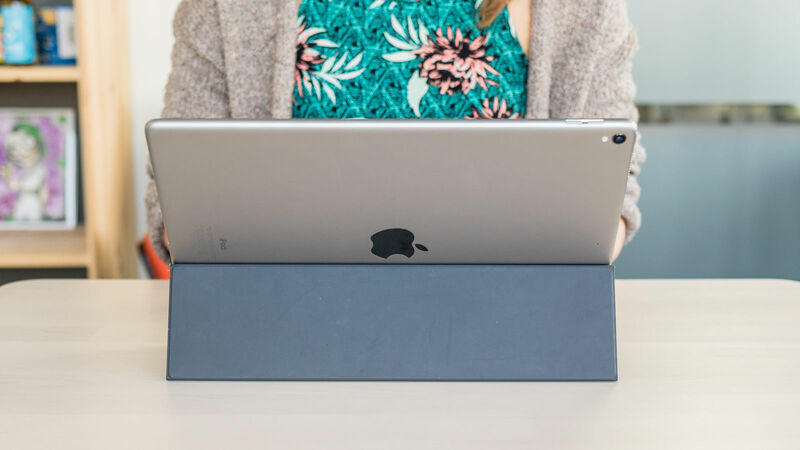 These are all positive steps towards helping professionals to spend less time on their desktops and laptops, and no doubt these latest iPads are going to greatly benefit from the updates. The new didn’t quite outpace and outshine my older larger model to the extent that I’ll be updating just yet, but if you’ve been thinking about whether an iPad Pro could work for you, then I hope this review has been of use. That the iPad Pro works so well for artists is as much a testament to the creators of apps such as Procreate as it is to Apple. Those working in other creative fields, however, are less well catered for. Whether you’re a designer or animator, you can only go so far with the iPad Pro. And a lot of the reason for that lies with Adobe, who clearly sees the iPad as being for the beginning of a creative process that ends up in a desktop app like Photoshop, Illustrator, InDesign, Premiere Pro or After Effects. Adobe has created some excellent apps for rough sketches, cuts and comps – but nothing that you could that produce a finished project or even an asset with. While the something-for-everything approach of Photoshop is a bit bloated to run smoothly on the iPad, there’s no reason why the likes of Photoshop Fix and Draw need to be so basic – or why fully-featured but focussed tool for photographers, artists or digital designers (emulating what Sketch offers on the Mac) couldn’t be created. Affinity Photo shows that a full set of professional photo-editing tools can run on the iPad. Adobe XD would also be a natural tool for the iPad, though you’d need better drawing tools (in XD or Illustrator Draw) – but if Adobe was to release a version it would probably have to wait for iOS 11 to ship in the autumn. Pretty much all design applications – including XD – have a creative process of combining elements that you or others have created in other applications. These don’t work well in the iPads filename-free filing system – finding an older image to insert into a project is only to be attempted by anyone who likes endless scrolling. Dragging text, images and video from one app to another – a process that underpins MacOS – isn’t possible. iOS 11 will add the Files app, so you can treat your iPad like you treat your Mac – with files available for sharing via Dropbox, Box, Creative Cloud or iCloud (for those who’ve given in to Apple’s incessant demands to pay for more than a tiny bit of storage). There’s also proper app-to-app drag-and-drop. But it remains to be seen if this encourages a real digital design tool for the iPad, perhaps from Adobe – or a young usurper as we saw with Sketch when Adobe bailed on Fireworks. The iPad Pro is an incredible creative tool. 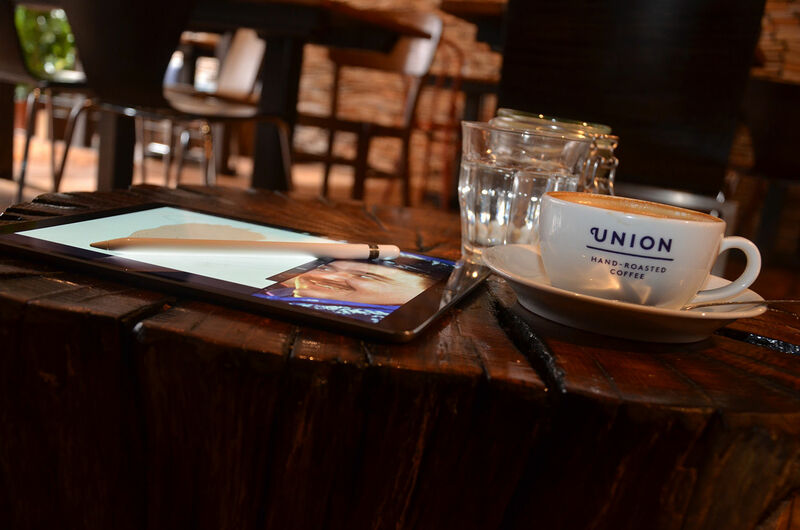 For artists and illustrators who want a portable drawing and painting device, it’s more than a match for the Microsoft Surface Pro or Wacom MobileStudio Pro (unless you prefer the extra three-inches of screen that you get from the 16-inch Wacom). For designers, editors and the rest though, Windows-based tablets still offer the ability to finish projects in a way that the iPad Pro doesn’t. However, if you’ve the budget the the 10.5-inch model is an excellent roughing/ideation tool that you’ll want to pair with an iMac or desktop PC (and the Duet Display Pro app lets you use your iPad Pro like a Cintiq). And iOS 11 may change that, so we’ll be redoing this review completely when it’s released in the autumn. What Are the Best Soundbars On Today’s 2017 Market? Hey there! It’s your lucky day to stumble upon my blog! What started off as a gradual progress in technology and a few fancy gadgets to be used in offices making work easy ended up in a total worldwide tech Boom.